"Eliette & Herbert von Karajan Institut"
The "Eliette und Herbert von Karajan Institut" is a private research and conservation project that aims to support academic studies on the life and work of Herbert von Karajan. The famous conductor shaped the Salzburg Festival after WWII more than any other artist; his widow Eliette, who is still a resident of Salzburg (or rather nearby Anif) supported the development of the Karajan Institut. The institute can be found in the Getreidegasse Lane in the centre of Salzburg′s Altstadt (Old Town). The current institute had a predecessor in Vienna, the "Karajan Archiv". It was founded in 1995 and transferred to Salzburg, the birthplace of Herbert von Karajan, in 2006, where the archive was merged with the Karajan Institut - which had been founded one year earlier. 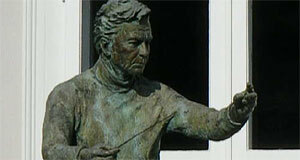 On the 5th of April 2008, Herbert von Karajan would have celebrated his 100th birthday. Upon this occasion, various symposia were held in Salzburg and its surroundings. The relatively new Karajan Institute became the centre of research dealing with the great maestro from Salzburg. According to its own mission statement and publications, the Karajan Institute has primarily three objectives: Firstly, it acts as a licensing body that manages most of the intellectual property associated with Herbert von Karajan and his artistic work. Secondly, the institute supports activities that nourish Classical music performance and consumption among young people. Thirdly, the institute supports research about Karajan and his work and manages the archives and a library.